The day started after a good nights rest (catching up from Wolfing and Grizzing yesterday) with some encouraging results from our denitrification experiment (apparatus above). We started with invaded soils from the Cinnabar site. We applied three treatments, water, Ammonium Nitrate, and Urea. Denitrification is a bacterially mediated process by which nitrogen (plant fertilizer) can be lost from soils as gaseous forms of nitrogen (NO, N2O, and N2). 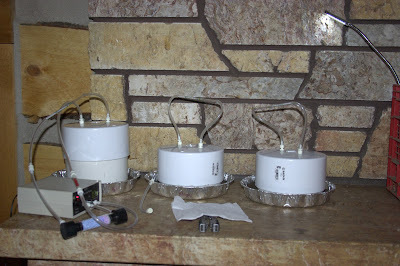 NO is the first step in the process and that is what we quantified using gas diffusion tubes that detect NO. By adding either ammonium nitrate or urea (simulating a urine hit from a grazer) we could determine if soils are losing N. Well the take home is yes they do. Both N treatments produced NO with ammonium nitrate producing twice as much as urea and the water treatment had no detectable production of NO. This is a great result and we can now deploy the system in the field, especially since it is finally warming up. Tonight we are setting up a run with native soils from the remnant/Landslide creek. Stay tuned. We then headed out to a native site outside of the park which used to be the post office for the area called Carbella. It is Bureau of Land Management land that during fire season in Paradise Valley is used as a fire camp. But it is as close to an intact system that does not have invasives that has comparable soils to Gardiner Basin. The one problem is that Bison do not graze the site because they don't have access (that's another story for another time). We did find a small cluster of Alyssum by the side of the road where the road grader has disturbed the soil. We spent some time weeding what we could find. This pic shows the native stand of grasses. They should be grazed. Tomorrow we will check the weather and then deploy the denitrifcation chambers and start working on Nitrogen mineralization. Perhaps a Sunday hike to the Petrified forest. The early results for the denitrification experiment in undisturbed native dominated soils is that there isn't any denitrification taking place. Cool result.